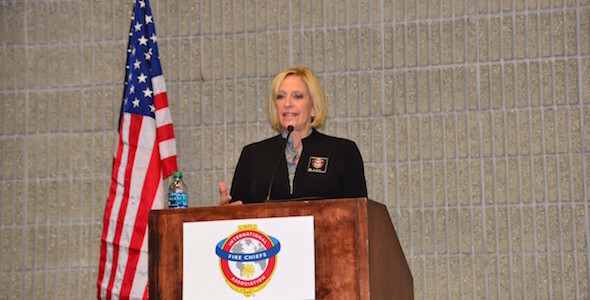 Despite knowing for some time that she’d be the first woman to preside over the International Association of Fire Chiefs, there was no wiping the smile off her face after U.S. Fire Administrator Ernie Mitchell swore her in at last month’s FRI. The fourth generation firefighter and New Jersey native began her career in 1983, rose to second in command in Fort Lauderdale, Fla., became chief in Little Rock, Ark. and has spent the past six years leading the Austin (Texas) Fire Department. Prior to her swearing in, I talked to Chief Kerr about her career, the fire service and her aspirations. Fire Chief: For those unfamiliar with IAFC, how does one become president? Chief Kerr: It is pretty intensive, especially since there’s a decision-making process of ‘do I want to do this’ and ‘do I have the time to commit to it.’ And you have to be what the IAFC calls certified. You have to have a letter from your immediate supervisor that acknowledges that they are OK with you running. Before I announced that I was going to run, I talked to my executive staff because they will be bearing a good part of the burden for the year that I’m president. I talked with my union president so they would understand what I was doing. It was a matter of making sure that people understood and were willing to support me. Once I got all of those things in place it was following through with the formal process of the IAFC. There was gaining endorsements, campaigning and visiting with the different divisions. All of that took time. Is there a benefit to the city to being IAFC president? There is absolutely a benefit for the city. Any time that I’m going to be traveling on behalf of the IAFC, I’m representing the city of Austin. That brings the recognition back to the city. There are things that you learn and new relationships that you benefit from that in turn benefit the city. What is the biggest challenge in the coming year? The biggest challenge for all of us, volunteer or a career department, is making sure that we retain our credibility and recognition on the national front. That can even be for our international partners as well. It is important that we are thought of as an important part of a city, county or state organization, that we remain at the top of that credibility. There’s a lot that goes into maintaining that credibility. Does that extend to the federal level? Absolutely. That [ability to get things like grant funding] is why it is so important we maintain our credibility. It is important that we are not thought of as ‘they’re not important; they don’t provide a good service; or as just a bunch of cowboys.’ We’ve got to protect our brand. What’s the state of the brand? It is fairly good. Even if I look at our organization and there are 1,200 firefighters and there are very few who bring discredit or would embarrass us. Generally speaking, everybody brings pride and a great deal of admiration to our organization. That’s true on a more global scale. There are some exceptions and we all read about them, where some fire chief or firefighter has done something, and it does discredit us. Overall, our credibility is very high. Do you have a signature accomplishment you hope to achieve as president? I’d like every fire chief to be able to get to zero fire deaths. That’s a huge goal, but if we are working on zero fire deaths, we are working on a whole lot of things. That includes grants, money and funding. It includes involving the community in outreach and education, smoke alarms and residential fire sprinklers. Is that zero civilian or firefighter deaths? Both. But if we got to zero fatalities on the civilian side, then we wouldn’t have firefighters going to fires and putting themselves in harm’s way. There’s a case where I had a 4-year-old and a 2-year-old die when the mother left them alone. They started the bedclothes on fire [with matches or a lighter] and were afraid they’d get in trouble so they crawled one behind the other between the bed and the wall. By the time we got there it was too late. Had there been sprinklers in that building, we wouldn’t be talking about those two deaths. We have to support those types of efforts. Is that something you will push for on the national level? I know everybody in the sprinkler coalition is working really hard to find a way to get the building lobby to acknowledge and accept that it is not as big of an expense as they tend to make it out to be. I don’t want to lock horns and have a year of fighting. I want to build some coalitions and build some support that maybe I start this and somebody has to carry it on. I want to build upon past accomplishments of reducing firefighter deaths. I want to find ways that we can be sustainable in areas of cost efficiency. We need to prepare for the future, and maybe part of that is how do we reduce the impact of fire to our communities. How we do that may be through things like sprinkler legislation. It is a process and not something I can achieve by the end of my term. But, the accomplishment would be if I got the process more attention. Who outside the fire service had the most influence on your career? One was my dad. My father always encouraged me to go after whatever it is I wanted to do. He was in the forest service and fought wildland fires. His father was a volunteer fire chief. And his grandfather was on the New York City Fire Department in the horse-drawn era. Maybe the influence was my family. And, she hasn’t been the most influential in my career, but my sister has been my biggest supporter. She’s been my biggest cheerleader, all of my life, not just in the fire service. Who inside the fire service had the most influence on your career? It was probably my first city manager, Bruce Moore. I had interviewed in major cities. I knew that I had the better qualifications, better experience and the better education, but they always gave the job to a man. When I had the one-on-one interview with the city manager in Little Rock (Ark. ), we had a number of different discussions. I said to him, ‘It takes a person of courage to name a woman their fire chief.’ And he gave me that opportunity and it had the most influence on my career. Was there a defining point in your career where you knew nothing could stop you? Is there gender and race discrimination in the fire service? It is probably a lot like it is in the country. Women still have bigger challenges, are scrutinized more closely and are sometimes treated irrelevantly in some departments. Some part is overt and other times it’s not overt. It’s a lack of inclusion, a lack of sensitivity to acknowledging what you should say to women. Look at what Donald Trump said [after the first debate]. Is that really OK? If it is OK for him to do that, then it is OK for some fire chief to make some stupid remark to a woman in his fire department. We’re doing better than we were when I joined 32 years ago. We can always do better in regard to women and minorities. The younger generation are much more open to race and gender. There are so many more multi-cultural families today than there ever were before. There’s a saying that dinosaurs lay eggs — some of it is passed on. And some of it is the culture of the organization. The IAFC talks about the five wicked problems, and one of those is culture. We have to make sure that we are leading in a way that our culture is more inclusive and doesn’t support bad behavior. Sometimes that culture manifests itself in that bravado and ‘We’re an aggressive interior structural firefighting organization.’ Then at 2 a.m. at a McDonalds two firefighters are killed in the line of duty. Why? Why were we inside a burning building like that? And at the end of the day, they bulldozed that building down. We didn’t save anything. Part of that is the culture. That type of culture sometimes generates inappropriate behavior. We need to lead with recognition of tradition, but we need to lead with changing culture. We don’t want to lose what is valuable to us, but we don’t need to hold on to things that are no longer relevant. What role does a paramilitary structure play into the culture? We can’t use that as a crutch. The paramilitary structure is important because we are putting ourselves in situations where we have to be sure that people are following orders and are trained to do what they need to do. And it gives us a sense of pride. I’m always proud to be a firefighter. My friends are envious that I go to work everyday and love what I do even on the hard days. That’s part of who we are. It plays into the culture, but it doesn’t have to play into the negative culture. You can have a paramilitary culture and still be respectful and not talk to people in a denigrating way. What role do you see women occupying in the fire service a generation out? I hope women are occupying more roles in the fire service, that there are more of us and that I don’t have to say there are three women [Phoenix Chief Kara Kalkbrenner and San Francisco Chief Joanne Hayes-White] who are fire chiefs of departments of 1,000 or more firefighters. I’m proud that I’ve made that accomplishment, but I want that to be the norm instead of the outlier. 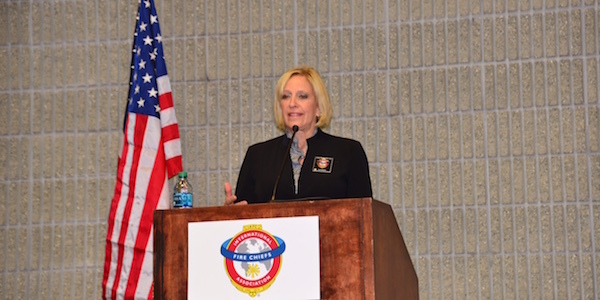 I’m honored to be the first president of the IAFC, but I don’t want to be the last. In 10 years, I hope that there are two women who are on the IAFC executive committee, or maybe all women for a change. What advice do you have for firefighters, men or women, aspiring to be leaders? Get as much experience in variation as you can. Don’t limit yourself to operations. Make sure you understand all aspects of the fire service. You may not want to be the lieutenant of prevention; you may want to stay on the truck in emergency operations. If you want to move up to be a leader, you have got to take different opportunities. You need to get your education and be involved in your community. Be a leader in many different ways. It can be any number of things, but you need to be involved and establish those relationships.